The Customer Data and Analytics (CDnA) team at Microsoft enables strategic data insights that shape the entire organization, from high-level leadership policies to small product decisions. At its core, CDnA creates and monitors indicators, known as “Power Metrics,” for some of the key divisions and businesses in Microsoft. CDnA delivers Power BI dashboards to several teams, including the Windows and Devices Group (WDG), Office, Bing, Cortana and Microsoft CEO Satya Nadella’s Senior Leadership Team (SLT). The SLT leverages the Power BI dashboards to monitor progress on strategic initiatives at the company. Both CDnA and the Power BI product have mutually benefited from a close relationship since the Power BI public preview in 2015. In fact, the early and ongoing input from this internal Microsoft team and its users has helped make Power BI the “enterprise ready”, robust, and feature-rich platform it is today. In 2013, the CDnA team started using an on-premises Microsoft reporting solution, leveraging PowerPivot integrated with SharePoint, Power View, and Excel Services. PowerPivot, for data modeling, and Power View, for data visualization, became the foundation used by Power BI. Greg Koehler, Senior Program Manager Lead for CDnA, was the first person to set up that early portal, and he began hearing about Power BI as the next big tool in late 2014. At the time, Power BI was only in preview and still being developed to accommodate enterprise-level requirements. Koehler and colleagues teamed up with Power BI Product Managers in a strategic partnership to work on prioritizing new features and migrating key reports and dashboards from Power View to Power BI. This partnership resulted in the development of several enterprise features for large teams, such as support for sharing dashboards and reports to security groups, improved interactivity for visuals and slicers, performance optimizations, and user experience improvements for Power BI Mobile apps. The partnership between the two teams continues today, and has helped encourage Power BI developers to create a truly enterprise-level service. CDnA has grown its BI portal to include additional teams, each of which maintains dashboards for audiences that vary from a dozen extremely busy executives to tens of thousands of curious monthly active users. Measures and values in this dashboard example are purely sample data and for illustrative purposes only. Click to see large version. With a company as large and complex as Microsoft, simply identifying key metrics can be a challenge, let alone wrangling the data from hundreds of sources. Power BI helps by uniting this data into a single report interaction model for end users, whether the data is from a cloud service, streaming data, or on-premises location. For CDnA, a seamless migration from Power View to Power BI was possible because both supported their on-premises SQL Server Analysis Services (SSAS) tabular data. CDnA users interact with hundreds of different data sources via the Power BI cloud, with all the CDnA on-premises data hooked up to a single Power BI Enterprise Gateway (with a few extra gateways for load balancing and redundancy). CDnA focuses on two types of data: usage and customer satisfaction. Customer satisfaction at Microsoft is often measured by Net Promoter Score (NPS), which looks at the proportion of customers that are most enthusiastic about a given product or service. A sample of users of all Microsoft products, from Cortana to Edge to Windows Calendar to, yes, Power BI, are asked for feedback, providing both numerical and anecdotal ratings. All new consumer desktop users of Windows 10 are sent similar ratings requests two weeks after installing the operating system. The data is stored in Microsoft’s internal data storage system, built on Azure Data Lake, and then aggregated into a more usable dataset that is ultimately processed into an Analysis Services tabular model. While it might sound complicated, and it would be to most people, Senior Data Scientist Sanjay Ramanujan calls the whole process very simple to use. “We scale down the data by taking the highest top box (survey choice) of 5 and the overall NPS score.” Dashboards are updated daily and display numerical KPIs as well as feedback “verbatims”, or open-form written responses. NPS score breakdowns are also provided by geographic area and product. Sanjay’s CDnA NPS team has numerous dashboards that provide a very good indication of what is, and is not, being well received by customers. Market share data is displayed in a dashboard known as OneShare, and supported by CDnA team members such as Karl Kreis, Senior Product Intelligence Manager. OneShare stemmed from the fact that Microsoft obtains many variations of market research data, from sources such as retail sales, competitive research, and distributors. In the past, much of this data was maintained by separate teams in separate reports, each assigning their own share value – which led to some apparent contradictions. Now, one Power BI dashboard sits on top of all the data, creating a single source of truth and driving greater alignment across every team. Dashboards designed for executives may not have a huge audience, but their insights are extremely valuable and shape the future of Microsoft. The Windows and Devices Group (WDG) analyst team in CDnA, for example, supports 50 dashboards with thousands of users, but also one dashboard specifically for executives. Kanchan Sachdeva is a Technical Data Analyst on the CDnA team who focuses on a very specific audience: the Senior Leadership Team, or SLT. This group is limited to about 30 of the most influential executives in Microsoft, and they base their decisions in part on a Power BI dashboard that is refreshed every day. The SLT dashboard focuses on 20-30 key metrics that drive Microsoft’s business, including break downs by region. This reporting solution is developed on top of a 2016 SSAS tabular model, and is redesigned every fiscal year to align with the most current company goals. The CDnA team keeps this dashboard very simple, without many details, and limits the use of “fancy” colors. For the upcoming fiscal year, they are using a Power BI custom visual, called Power KPI, to combine multiple visualization types into a single report tile. The CDnA team’s collective work made up 25% of all Power BI usage within Microsoft in early 2017. John Kahan, General Manager of the CDnA, praises the amazing relationship they’ve formed over time with the Power BI development team. 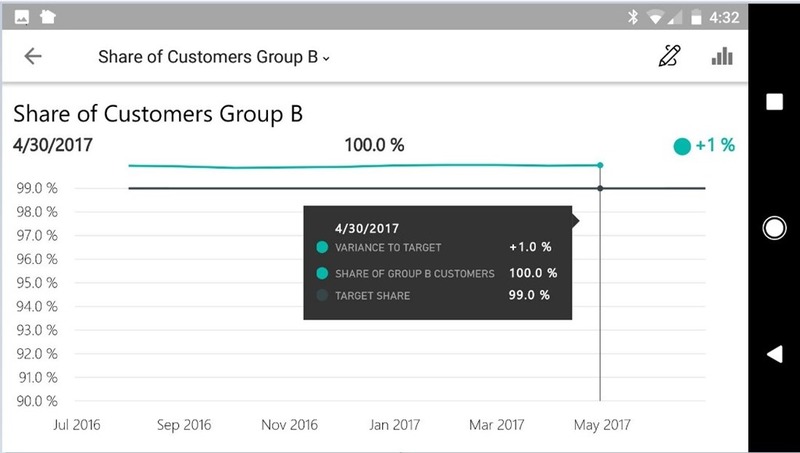 “We meet with the Power BI team weekly to share our most recent requirements, and they’re super responsive to our needs as customers. I haven’t seen a development team operate like that before!” Kahan praises Power BI’s visualization layer as the key for organizations that want to quickly understand trends and answer questions on the spot. Power BI is the tool of choice for Microsoft’s usage data, satisfaction metrics, and executive KPIs. If Power BI can help run one of the world’s largest and fastest moving companies, imagine what it can do for your business!